Hello friends we are here with RRB Railway ALP 2018 Exam: Important Notice fromRRB Thiruvananthapuram. We already shared the news RRB Railway ALP & Technician (CEN 01/2018) Exam for 17th August 2018 Postponed for Kerala, Notification Released at rrbthiruvananthapuram .gov.in, Check Now. You can check the recent notice from rrb railway board Thiruvananthapuram. 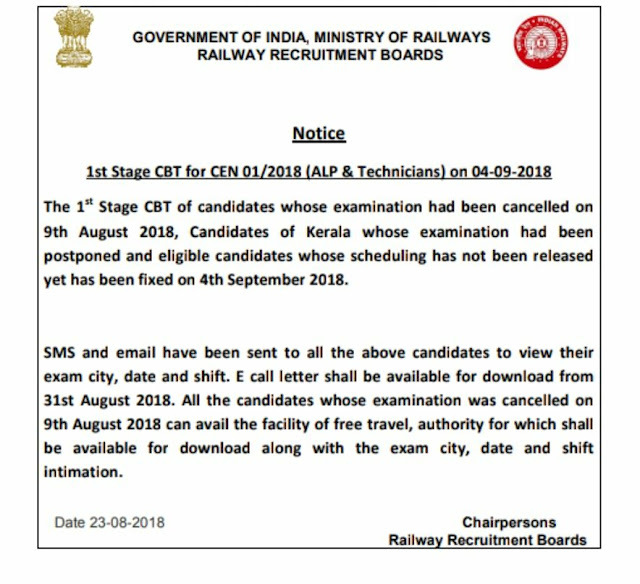 Today RRB has released a notice for those Candidates whose exam had been cancelled on 9th of August 2018, Candidates of kerala whose exam had been postponed and eligible candidates whose scheduling has not been released yet. Now the Railway ALP 1st stage Exam will be conducted on 4th September for these Candidates. Candidates can download their E call letter from 31st Augutst 2018. And all the candidates whose exam was cancelled on 9th August 2018 can avail the facility of free travel.